Bryan Forney literally doesn’t remember the first time he met award-winning actor Gary Sinise. Forney was lying critically wounded in a burn unit at Brooke Army Medical Center when Sinise visited. The former Marine Corps officer and pilot was wrapped in thick bandages from head to toe, but Sinise made a point to stop at his bedside to offer encouragement. Best known for his role as Lt. Dan in the film Forrest Gump, Sinise has become a hero to military personnel. He founded the “Lt. Dan Band” to entertain troops at Invincible Spirit Festivals organized by his Gary Sinise Foundation, which raises money for wounded warriors. 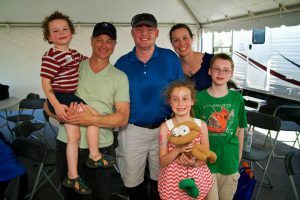 Sinise struck up a friendship with Forney and his wife, Jennie, via email after that visit in March 2013, following Forney’s injury in a horrific helicopter crash just a month earlier. The actor and activist saw Forney again seven months later, when he remained in a wheelchair. It wasn’t until a year later—in October 2014—that Sinise would again see Forney, then walking with revolutionary IDEO (Intrepid Dynamic Exoskeletal Orthoses) braces, invented in 2010. Watch a moving ESPN Veteran’s Day video of the emotional reunion between Sinise and Forney at www.tinyurl.com/Forney-Sinise, and view a 3-minute clip from a PBS documentary featuring Forney in his IDEO braces at www.tinyurl.com/Forney-IDEO.